Sbode speaker produces impressive true HD 360° stereo sound. Two Precision drivers deliver clean clear highs and mids. Double bass radiators delivers enhanced Bass output in a small size. The result is surprisingly sound with a small footprint. If you think one Sbode speaker sounds great, you'll love how they sound together. Pairing two speakers together to play left channel and right channel for incredible stereo sound separation. Only press the “TWS” button to pair them. No wire needed. Covered with a woven mesh-like material and rubberized housing with bumpers on either end for added durability. Cylindrical design with a stylish combination of curves and angles with no hard corners. Plays standing up or laying down. Rubberized contact points protect furniture and other surfaces. 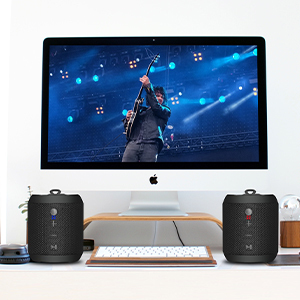 The speaker has been thoroughly and specifically tested to withstand both water and dust. Completely sealed from dust and water-spray in all directions. Perfect for beach, shower, swimming pool and all water environments. Enjoy the music wherever you want. Built-in wireless FM, compact and easily tunes in local stations, you will get clear sound and great reception for the stations from the neat little radio. Automatic / Manual search and store the radio station. Enjoy super clear FM signals indoor or outdoor. 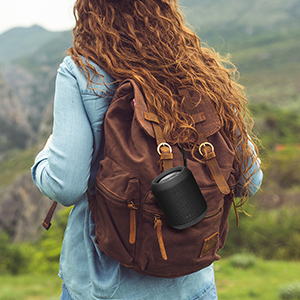 The lightweight Sbode speaker easily stows away in your suitcase or your backpack so you can enjoy it wherever your travels take you. 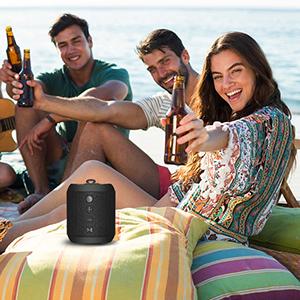 With an impressive battery life of up to 8-hours, this portable speaker is ready to go along for the ride, the flight or the hike. You don’t stay in one place so why should your music? Sbode speaker produces impressive true HD 360° stereo sound. Two Precision drivers deliver clean clear highs and mids. Double bass radiators deliver enhanced Bass output in a small size. The result is surprisingly sound with a small footprint. If you think one Sbode speaker sounds great, you'll love how they sound together. Pairing two speakers together to play the left channel and right channel for incredible stereo sound separation. Only press the “TWS” button to pair them. No wire needed. 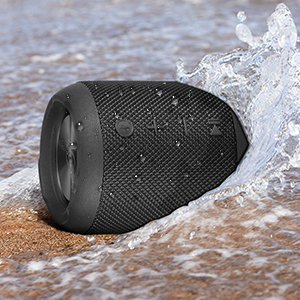 The speaker has been thoroughly and specifically tested to withstand both water and dust. Completely sealed from dust and water-spray in all directions. Perfect for the beach, shower, swimming pool, and all water environments. Enjoy the music wherever you want. Built-in wireless FM, compact and easy tunes in local stations, you will get clear sound and great reception for the stations from the neat little radio. Automatic / Manual search and store the radio station. Enjoy super clear FM signals indoor or outdoor. Holding the speaker in your hands for the first time, you will immediately notice a unique and awesome feel to it. Covered in a woven mesh-like material and built with a solid, rugged feel, you knew you are in for a treat. our favorite inclusions as seem to really make a difference in the overall listening experience. More on this in the “sound” section below. balance between high-end harmonies and thundering lows. right situation, this could make a realistic difference. specifically tested to withstand both water and dust, but isn’t safe to be submerged into water. In other words, you can take it out in the dirt, rain and wind. Providing 9 hours playing time and only takes 2-3 hours to be fully recharged. Does this have an SD slot to play music from? Yes! There is an SD slot near the USB charge port that can play music through it. 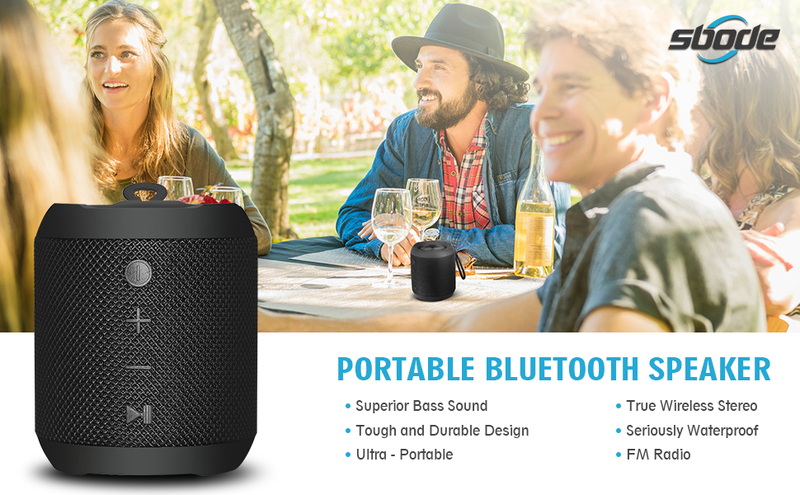 The speaker is Bluetooth 4.2, it is fully compatible with each Bluetooth version device. It is designed to pair and connect quickly to your device. It does and works perfectly! It is easy to pair just go to a setting between the speaker and Alexa app! Is there some kind of light, that indicates when it is on, and when it needs to be charged? Yes, my friend! When you turn on the speaker the blue indicator light will be on. And the speaker will prompt "battery low" when it needs to be charged. Hope to help you. Would this be loud enough to use outside at the pool or grilling outdoors? For its size, its surprising loud & clear. Works great with any Bluetooth devices and non-Bluetooth devices (3.5mm Audio cable comes with the package). Long battery life as well. What is the Bluetooth range of this speaker? As it is loaded with the latest Bluetooth 4.2, the range can up to 10feet. Can this Bluetooth speakers work with a windows 7 computer? Thanks for your question, this speakers can work with a windows 7 computer via connecting a Bluetooth receiver. Or you can plug into aux cable. How many watt this speaker? 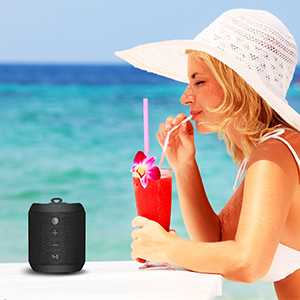 Hi, the Sbode Bluetooth speaker has 12 watts; over 6 watts per channel. 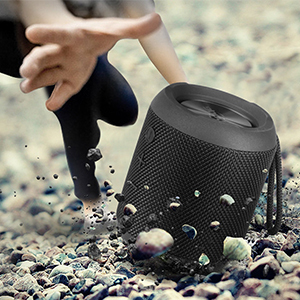 Yes, the Sbode Bluetooth speaker is a true stereo speaker. The speaker has a stereo amp and one driver is for the left channel and the second driver is for the right channel. How long is battery will last? It will last about 8 hours in a full charge. Is it loud enough to use in an indoor party? This speakers suit for the indoor party well. The sounds can hear it clearly throughout the 2-bedroom home. Shipping usually will take 3-7 days to come to your door. All of your items will be shipped from LGB8, 1568 N Linden Ave, Rialto, CA 92376-8624, US (LGB8) Please kindly note it.